This stunning reel compliments the Merisuola family of rods to provide a balanced outfit that challenges any game fish available to the global angler. 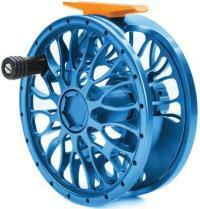 With a powerful, sealed adjustable braking system these full rim reels reach maximum performance when tested amongst the hardest fighting fish. Waterproofing is via the best axle seals from German Ina with high quality bearings from Japan. Bonefish, Permit and Tarpon graphics beautifully etched into the relevant reel's hidden counter balance.